lt;stronggt;SAF5238BLlt;/stronggt;lt;BR/gt;Safco Scoot Mail Cartlt;BR/gt;All-steel construction with modern styling. Convenient handle and side storage pocket. Top basket holds legal size folders. Bottom shelf with lip holds packages and supplies. Front swivel casters and oversized rear wheels for effortless movement around the office. Color: Black/Silver Capacity Weight: 300 lbs. Caster/Glide/Wheel: Two 3amp;quot; Front Swivel Casters, Two 8amp;quot; Oversized Rear Wheels.lt;BR/gt;lt;BR/gt;lt;stronggt;LEE40100lt;/stronggt;lt;BR/gt;Safco Scoot Mail Cartlt;BR/gt;Easily separate backing paper from self-adhesive stamp rolls. Patented dispenser is durable and reusable. Just drop roll in the dispenser, feed through the slot, feed backing under slots and pull backing to dispense. Use 50 or 100 count rolls or stamps, address labels, labels or stickers, up to 1amp;quot; wide. Capacity text: One 100 Count Roll Colors: Black Materials: Plastic Size: 2amp;quot; dia. 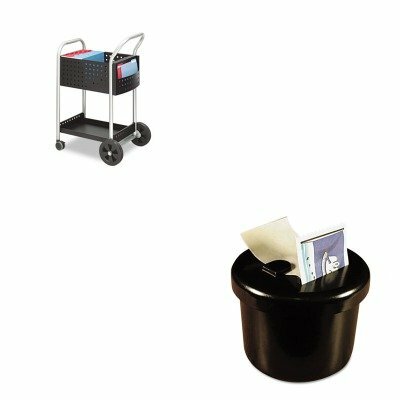 x 1 11/16amp;quot; h..
Safco - Wire Mail Cart 600-Lb Cap 18-3/4W X 26-3/4D X 38-1/2H Metallic Gray "Product Category: Office Furniture/Mail Carts"
Safco - Scoot Mail Cart One-Shelf 22W X 27D X 40-1/2H Black/Silver "Product Category: Office Furniture/Mail Carts"
Safco - Wire Mail Cart 600-Lb Cap 18-3/4W X 39D X 38-1/2H Metallic Gray "Product Category: Office Furniture/Mail Carts"
Vertiflex - Instacart File Cart 15W X 28-1/4D X 27-3/4H Black "Product Category: Office Furniture/Mail Carts"
Safco - Scoot Mail Cart One-Shelf 22-1/2W X 39-1/2D X 40-3/4H Black/Silver "Product Category: Office Furniture/Mail Carts"